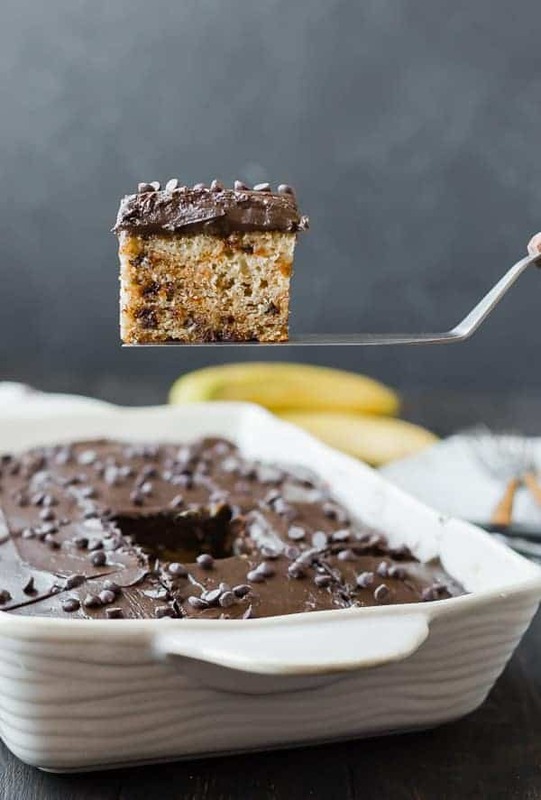 This banana cake is ultra-moist, flecked with chocolate chips, and topped with a thick layer of chocolate cream cheese frosting. It’s going to become a quick favorite! 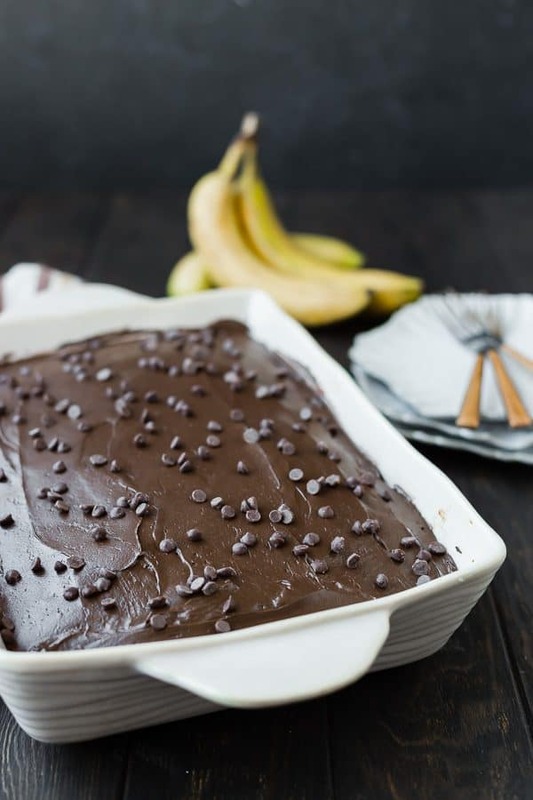 Bananas and chocolate, a match made in heaven, no? This banana cake is one of my absolute favorite things that my mom makes. It is so very moist, and topped with a cream cheese frosting…it is just perfect. 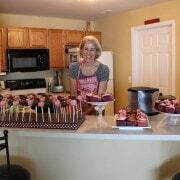 I featured it once before on my blog, without chocolate chips, in the form of cake pops. I took it totally over the top. Like…hurt your teeth over the top. But it’s good, really good. My mother in law said this was “the best cake and frosting she ever had.” And let me tell you–the woman is no cake novice. I consider this an expert opinion. I also ate waaaaay more than my fair share of this. But I’m pregnant. So it’s cool. Jillian Michaels and I are going to be best buds come December. 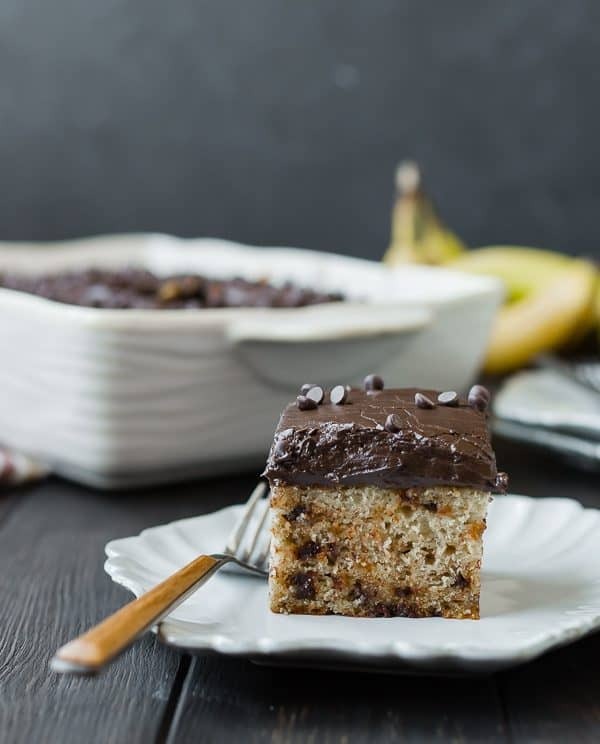 This banana cake is ultra-moist, flecked with chocolate chips, and topped with a thick layer of chocolate cream cheese frosting. It's going to become a quick favorite! Add rest of ingredients to the dry ingredients and beat on low-speed until combined. Increase to medium speed and blend for 3 minutes. Fold in chocolate chips. Spread into a greased 9″x13″ baking dish and bake for 30-35 minutes or until a toothpick inserted into center of cake comes out clean or with crumbs. In large bowl, using an electric mixer, beat together cream cheese, butter, vanilla, and milk until smooth. Add in cocoa powder and powdered sugar (one cup at a time) and continue to beat on low speed until frosting is smooth and to your desired consistency. Spread on cooled cake. Due to the cream cheese in the frosting, this cake should be refrigerated. Cuisine: American	/ Category: Cakes, etc. Verdict: I could have eaten the WHOLE ENTIRE PAN. I almost did. Husband’s take: He loved it. He kept calling it banana bread. I like that because it sounds healthier than it really is. Changes I would make: Maybe less frosting next time. I know, I can’t believe I just said that either. If you wanted to turn this into a layer cake, the amount of frosting would probably be perfect. However, if you don’t have a HUGE sweet tooth, I’d suggest halving the frosting for a 9×13. Ben agrees. My mother-in-law disagrees. I’m torn. I do love this frosting. Updated: I’ve made this enough times now to say that the amount of frosting is perfect. I tried your recipe, it was just delicious !! It was hard not to eat everything in one day ! 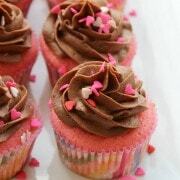 ;) I did them without the frosting and it was just fine that way ! I shared your recipe on my blog (in french). I’m wondering if regular chocolate chips would be OK? I’ve already got them on hand. Would they be too weighty? I think regular chocolate chips would probably work. Fat free cream cheese–probably…but it won’t be as delicious! Hey, Rachel, It actually turned out pretty awesome! I think the chocolate chips were more likely to settle at the bottom, but it didn’t matter from bite to bite. The frosting was probably not AS good, but it was still fabulous. I probably only did about 2 cups powdered sugar because I’m not big on sweets…so it was a bit more tangy, but in a good way. Thanks for the recipe! Cool! Let me know how it turns out GF! I made this gluten free last weekend, and it turned out great!I blogged about it tonight with links to your recipe/blog, and listed the flour substitutions that I used. 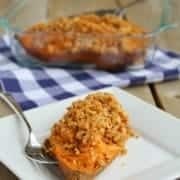 I can’t wait to make this again – it was a big hit with my hubby and kids…and seriously I could have eaten it all myself – it was sooo good!P.S. I am loving your Pancake Party! looks so amazing. i trust your mother in law! Oh my gosh – that frosting!!! 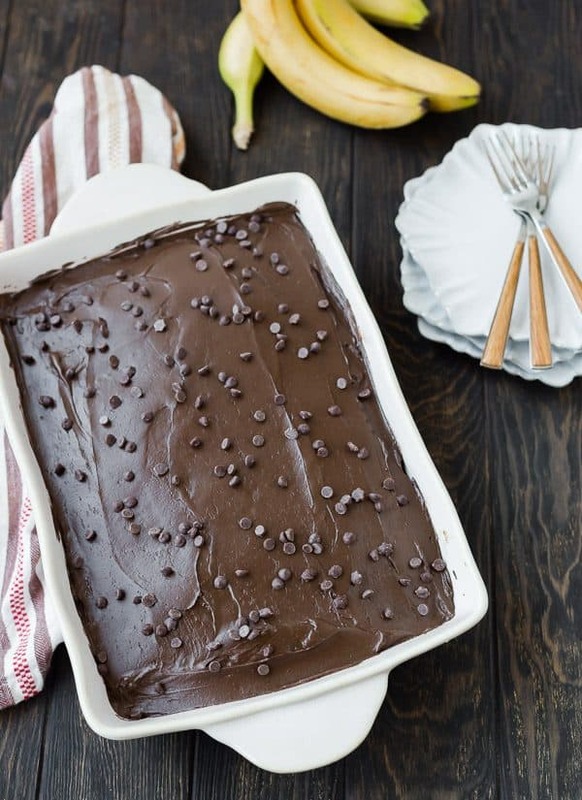 I love banana bread with chocolate chips so of COURSE I would love this cake…looks delicious!! I am saving this! It looks amazing. this looks SO good and decadent. the cake part and the frosting part look like a match made in heaven! Definitely making this as soon as I get home!!! Well I need to try some of this. I mean, the best cake she ever tasted? Bring it on! Jillian Michaels is no ones best bud lol she’s the devil I swear. This is such a fun cake! First of all, this is seriously a dream cake. I loved that you used buttermilk; I bet it was insanely moist. Secondly, I just wanted to tell you that I really enjoy your blog. Okay and finally… Pancake party? I can’t wait. 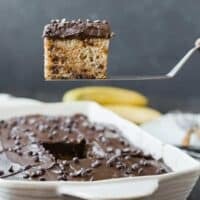 I love the proportion of chocolate in this recipe! Oh my, that chocolate frosting looks heavenly! And I could eat the entire pan too and I’m not prego. Is that bad? Oh my gosh, yes! Pregnant or not, I want this in my face. I honestly…I don’t even know what to say. I’m only *just* starting to get into the banana-flavored-dessert thing, but this looks a.maz.ing. And um there is NO way I’m halving that frosting recipe. Your MIL and I are together there for sure. Yum! It’s like banana bread’s cool older sister, haha. Seriously, this looks amazing. I wish bananas stayed in my house long enough to get mushy so I could try to make this too! Oh man, that ICING. This is incredible. This sounds amazing! And that frosting. . .pretty sure I’d be eating it straight from the bowl! Woah. There is nothing about this cake that doesn’t make me want to fight someone for it. Looks so, so good, Rachel! Not pregnant but pretty sure I could devour most of that cake too! Chocolate cream cheese frosting? Oh my! I would have to side with not halving it. Although the cake looks pretty amazing too. Drooling. I’d eat the entire pan if it was in front of me. This looks just amazing! I’ve just had an attack of cake craving and I’m not pregnant! It looks delicious. This would be totally acceptable to eat for breakfast, right?? Because that’s so what I’d do right now if a slice appeared in front of me :) Looks awesome! I LOVE bananas…. and my family ~ does not! Ugh. How is that possible? This cake looks so delish…. and will be the perfect thing to make when I have some girlfriends over for lunch soon. Can’t wait to try it! !